Before Friday night I’d never seen the TV show Shark Tank. With a day job and a soap making business, I don’t have a lot of time for television. I quickly became a fan when my son Steve Bofill was on the show. 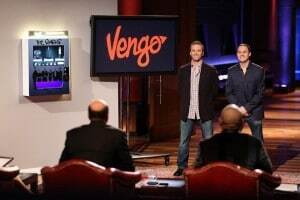 He and Brian Shimmerlik co-founded a company called Vengo. The exposure and opportunities that will come from Shark Tank are just beginning. I’m grateful for Shark Tank. Can you tell that I’m a proud mama? I never saw Shark Tank before, but I’m going to keep watching. It’s very interesting to see people pitch their product and business plan in a minute. I know people talk about having the elevator speech, but seeing your son and partner stand there being bombarded by questions and pressured to make a decision was eye-opening. I don’t know if I would be prepared to defend my business in that way. Yikes. Thanks Donna. I was on the edge of my seat while Vengo was on. Both Brian and Steve knew the outcome, and they did a good job of keeping it a secret from all of us. My daughter loves that show. I am so happy your son was able to secure investing. Congratulations.